Character property to develop near mont st michel! Ille-et-Vilaine has, over the years, been quite a puzzle to visitors. Like the other Breton departments, it is distinctively different from the rest of France, however it is not attached to the Breton identity. French is universally used, although you'll still have to understand the thick Breton accent. Ille-et-Vilaine has a mere one hundred miles of coastline along its Northern edge, which may go some way to explaining why the department feels separate from the sea orientated Breton culture. Ille-et-Vilaine certainly has a lot to celebrate in its inland areas, however. Green valleys, deep forests and blue lakes can be found in abundance across the department. Among these you will discover tiny villages that have maintained their traditional way of life. To the East, you'll come across a number of fascinating castles and fortress towns. Some of these were built to defend the Bretons from attacks, while others were simply a way for rich land owners to show their wealth. The most impressive are located in Fougeres and Vitre. St Malo is a popular place to begin any stay in Brittany. Not only does St Malo itself have lots to offer its visitors but Dinard is just a stone's throw away across the River Rance. In the 16th Century, the town was an independent republic. These days it is far more integrated with the rest of the area and makes a great base for exploring. In the 17th and 18th Centuries, St Malo gave the world a number prominent pirates. In fact, a large portion of the town's wealth can be accredited to this profession. Rennes is the capital of Ille-et-Vilaine and also the Brittany region. It has two universities that provide the town with a quarter of its population. The result is a very youthful and vibrant town with a very diverse and cosmopolitan atmosphere. The streets are always awash with artists and actors showing off their talents. 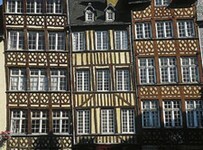 Rennes is keen to impress visitors with its clean living and its well-preserved history. You can spend hours wandering around in admiration of its Medieval houses jutting out above the streets below. The popularity of Brittany to English buyers is, in large part, because of the ease of travelling here. If you want to travel by air, Rennes airport lies centrally within the department, with Dinard, Nantes and Angers airports providing alternative options. The closest ferry port is St Malo, though Cherbourg and Ouistreham (Caen) are also within reach. Rennes is one of the region's biggest airports, and currently has flights with flybe and Aer Lingus. Flybe operates from Southampton, Exeter and Manchester all year round and in the summer, also flies from Edinburgh and Belfast. Meanwhile there are direct flights between Rennes and Dublin between June and October with Aer Lingus.There are regular ferry crossings to both Roscoff and St Malo. Caen and Cherbourg in Normandy are nearby ports with regular crossings. Condor Ferries go from Poole and Weymouth to St Malo. The large cities of Rennes and St Malo are where the most expensive properties are to be found. Many British buyers are beginning to buy in the West of the department, towards central Brittany as there are a reasonable number of cheaper properties available here. Do you know Ille-et-Vilaine better than we do? Do you have photos of Ille-et-Vilaine? Ille et Vilaine is the eastern section of the Brittany region.